Incorporating the teachings that won the hearts of millions, The Power of Positive Thinking is a best-selling self-help book which outlines Norman Peale's philosophy of winning in live and defeating obstacles through optimism. 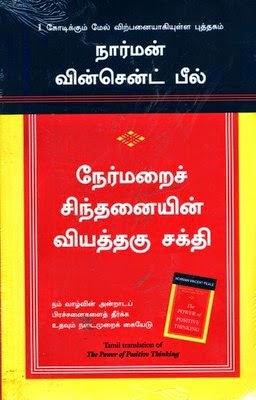 This edition is a careful rendition of the original into the Tamil language. In clear and lucid language this book explains how to face self-doubt, man's greatest obstacle. Examine how to free oneself from worry, stress and a lack of fulfilment through positive thinking. Using the same principles Dr. Peale preached on a daily basis, empowering millions who flocked to him for his teachings, this book is the answer to life's difficulties and teaches readers to deal with stress from all aspects of life. Improving lifestyle by mere thought is never easier than it is through the words of Norman Peale. Norman Vincent Peale was an American Minster and author. He is best remembered for his theory of positive thinking. A Methodist by education, Peale converted to to the Reformed Church in America and served as the pastor of Marble Collegiate Church in Manhattan for 52 years. Close to powerful figures such as US Presidents Richard Nixon and Ronald Reagan, Peale preached his principles upto the ripe old age of 95. A prolific writer, he is also remembered for: Stay Alive All Your Life, Six Attitudes for Winners, In God We Trust: A Positive Faith for Troubled Times, Positive Thinking Every Day : An Inspiration for Each Day of the Year, You Can If You Think You Can and Power of the Plus Factor among other bestselling titles.